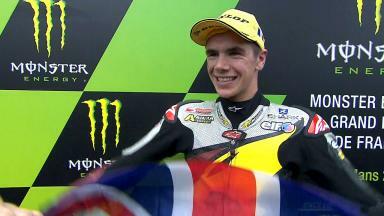 Britain’s Scott Redding has triumphed in Moto2™ for the first time, winning a rain-affected Monster Energy Grand Prix de France. It was a one-two finish for the Marc VDS Racing Team as Mika Kallio finished second, but there was disaster for numerous championship contenders who slipped out of contention. Redding’s emotional victory makes him the first British rider to win at Le Mans since Alan Carter took the chequered flag in the 250 race of 30 years ago; his own previous career win had been in the 125 class, at Donington Park in 2008. This afternoon’s success it was no easy feat, as at the start the 20-year-old had plummeted to ninth position off the wetter, right-hand side of the track following heavy rain overnight. Takaaki Nakagami led in the early stages from Pol Espargaro. Unbelievably, both Espargaro and championship-leading Tuenti HP 40 teammate Esteve Rabat fell in harmony at Musee corner, dropping down the order on Lap 3. Nakagami was left with a three-second advantage, but the Italtrans Racing Team man lost control at the same corner just four laps later as sprinkles of rain made for a greasy track surface. The intermediary conditions contributed to retirements for no less than ten riders, including Mapfre Aspar Tech Moto2 pairing Jordi Torres and Nico Terol, Interwetten Paddock Moto2 Racing’s Tom Luthi and the independently-funded Gino Rea, who had remarkably reached a high of 12th position from 31st on the grid. 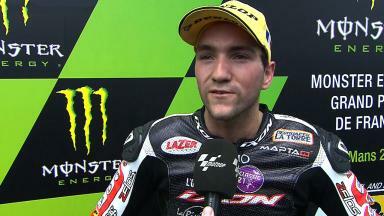 A strong recovery ride from Redding saw him rise to the front on Lap 8, passing Johann Zarco who had delighted the French crowd by leading. Redding’s teammate Kallio looked to threaten as he typically grew stronger and pushed on in the second half of the race. 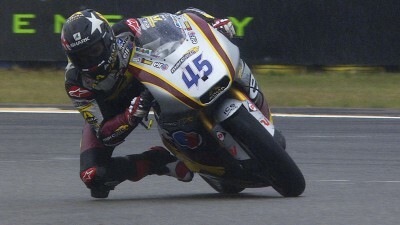 Heavier rain towards the end threw a spanner into the works for Redding, but red flags flew on the 24th of 26 laps. 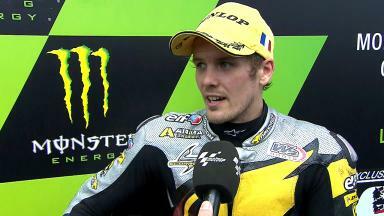 As the result was declared at the end of Lap 22 (the last which all riders had completed), Kallio inherited second position despite being overtaken by Xavier Simeon before the stoppage. Nevertheless, the Belgian Desguaces La Torre Maptaq rider still achieves a first ever podium finish. Technomag carXpert’s Dominique Aegerter and Came Iodaracing Project’s aforementioned Zarco were fourth and fifth from NGM Mobile Racing’s Mattia Pasini, JiR Moto2’s Mike di Meglio (in his home Grand Prix) and Italtrans’ Julian Simon. Anthony West and Alex de Angelis completed the top ten for QMMF Racing Team and NGM Mobile Forward Racing, respectively, as reigning Moto3™ champion Sandro Cortese scored his first Moto2 points, in 13th place for Dynavolt Intact GP. In 15th, the final point was collected by Frenchman Louis Rossi (Tech 3) who had won the Moto3™ race at Le Mans 12 months ago. 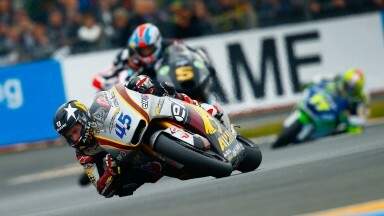 Moto2™ has now witnessed four different winners from as many races at the start of the 2013 season. As the series moves on to the Gran Premio d’Italia TIM at Mugello, Redding retakes the championship lead and is 24 points ahead of Rabat.